What happens to foot traffic when new venues open at American malls? Social-media platform Foursquare investigated, and it determined that the most significant factor in the success of any new retail location is its “categorical fit” with the mall’s existing ecosystem. 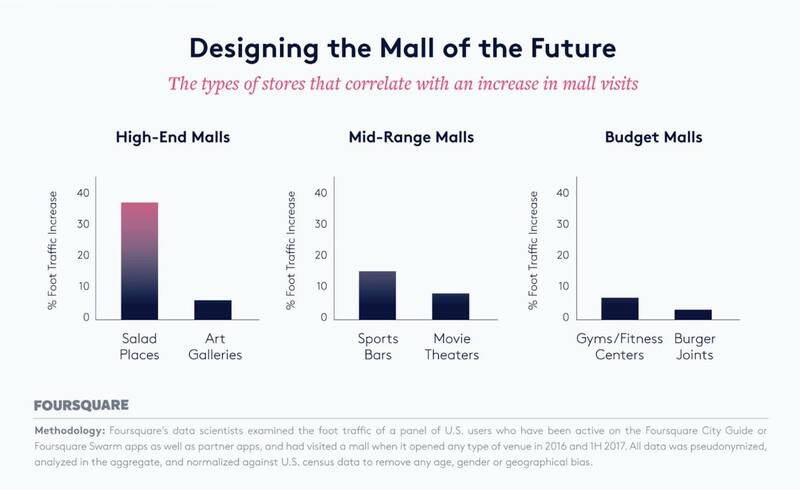 “Consumers have certain expectations when they visit a mall,” wrote Felix Peutsch, Foursquare’s head of analytics, in his report on the research. “For a new tenant to add to the overall health of the mall, it should land within the expectations of the existing consumer set and make sense for the ecosystem that exists." Foot traffic to a high-end mall with retailers like, say, Apple or Saks Fifth Avenue increases with the introduction of food establishments that are healthy and trendy. One success story is Tysons Corner Center, outside Washington, D.C., which saw a roughly 20 percent boost in foot traffic from the previous year, driven in part by an ongoing renovation-expansion that included the openings of a Jinsei Organic Juice Bar, a Kung Fu Tea and a Sweetgreen salad shop.